Yao Woman with Children, Yao Village in Chiang Rai Province, Northern Thailand. They are to be found in China, Vietnam, Laos and Thailand. In Thailand there are approximately 55000 Yao in widely scattered villages in the provinces of Phayao, Nan and Chiang Rai, and perhaps another 10000 or so refugees from Laos, living in refugee camps along the border. 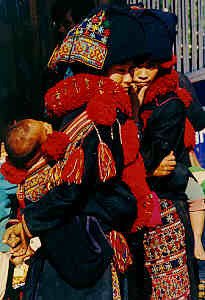 The Yao originate in southern China, and are the only hill tribe to have a written language. Yao villages are mostly found on low hills, and their houses built usually of wooden planks on a dirt road. There is a guest platform of bamboo in the communal living area. Their economy for several generations has been based quite largely on the cultivation and marketing of opium, although opium addiction is relatively rare among them. With the present drive to stamp out the cultivation of the opium poppy in Thailand, the Yao find it necessary to seek other means of livelyhood. Yao women are noted for their magnificient cross-stitch embroidery, which richly decorates the clothing of every member of the family. The costume of the women is very distinctive, with a long black jacket with lapels of bright scarlet wool. Loose trousers in intricate designs are worn and a similarly embroidered black turban. Yao silversmiths produce lovely silver jewelry of high quality. Yao Woman with her Baby, Yao Village in Chiang Rai Province, Northern Thailand. The Yao have a written religion based on medieval chinese taoism, although in recent years there have been many converts to christianity and buddhism. They are very peaceful and friendly, who pride themselves on cleanliness and honour and they are called the "businessmen" among the hilltribes. Thank you for visiting Thailand online ! Please come back again.